Five the six unique lodging properties and resorts are open year round. Kennebunkport’s family resort hotel. Affordable rates and Kennebunkport’s only resort with indoor & outdoor heated pools, indoor & outdoor hot tubs, sauna, fitness center & function room. Poolside Restaurant in summer with poolside lobster bakes. All located less than a quarter mile from the ocean and one mile from Walkers Point and Dock Square. On the Trolley Route. Kids Stay Free. Off-season packages with excellent value. A resort with all the amenities. Attractive room rates. Open year round (except Jan). Experience the only AAA 4 Diamond Bed and Breakfast in Kennebunkport. Offering luxurious yet comfortable lodging that is ideal for a romantic getaway. Meticulously guestrooms decorated and designed to offer you a serene interlude filled with special touches such as cozy gas fireplaces, oversize 4-poster beds, double jet tubs and hydro-massage showers. The inn’s staff offers impeccable attention to guest needs and desires. On-site spa offers a variety of relaxing and pampering couple’s treatments. Packages and seasonal specials! 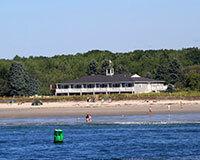 Oceanfront Inn and Resort directly on Kennebunk Beach with Inn, Cottages and beach front House. Ocean view and Beachfront Lodging with Ocean and directly on the beach. Special Off-Season Packages. Family Innkeepers since 1667. Open year round. Free Wireless Internet. Hot Tub open year round with outstanding ocean views. Free Bikes. Kennebunkport’s beachfront address. If staying directly on the beach is what you had in mind then you simply must visit the Seaside. House rentals directly on Kennebunk Beach also available for rent. Established in 1883, this enchanting Kennebunkport resort delivers on the promise of an authentic Maine waterfront resort. It’s steeped in casual historical elegance – with just the right modern comforts. With waterfront views in coastal Maine, the Nonantum offers everything you need to create life-long memories. From the perfect coastal Maine wedding, romantic getaways or corporate retreat this truly is the perfect setting for life’s special events. Located right on the Kennebunk River, offering an easy walk, or complimentary shuttle ride, to the shops, art galleries and restaurants in Dock Square. The Nonantum is the place to call home as you enjoy food fresh from the farm and the sea in “95 Ocean” restaurant, boat tours, fishing, sailing, scenic strolls, bike and kayak outings, or just sitting by the heated pool watching the lobster boats and picnic yachts idle by. The Nonantum is a family owned-resort Where Traditions Begin. The Boathouse Waterfront Hotel is located on the Kennebunk River, just steps from Dock Square in central Kennebunkport. Guest rooms exude warmth and elegance with custom headboards, mahogany cabinetry, and private balconies with cozy seating, encouraging guests to enjoy a good book or soak up the sweeping views. Guests love our rooftop deck and onsite waterfront restaurant, The Boathouse. With a creative menu, two vibrant bars and spacious outdoor deck with cozy seating, The Boathouse has become a locals’ favorite in recent years.